There's something about young adult fiction set over the course of one day, especially into the wee hours of the night, that instantly draws me to it. I love a good story that materializes over a shortened period of time. One would think not a lot could happen in just under 12 hours, but it is the attention to detail that produces just enough oomph to give it a solid story. 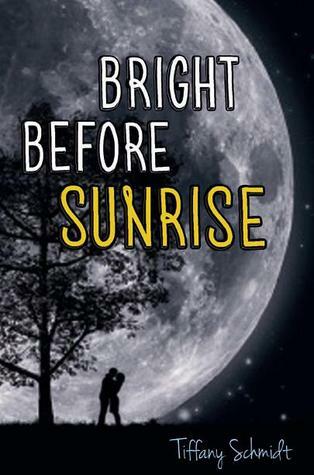 The beginning of BRIGHT BEFORE SUNRISE starts out giving the reader a depiction of two characters. Brighton is your Miss Popular welcoming committee extraordinaire who appears to have it all together. While Jonah is the loner who just arrived at a new school wearing a scowl and keeping everyone at a safe distance. We follow their stories on Friday afternoon, just as their school day is ending. They collide a few times, but for the most part their stories are carried down separate paths. At first I felt the story was dragging and I was missing something crucial. Schmidt did a good job of setting up these characters and the situations they were in, but things were progressing a little too slowly for my liking. I knew Brighton wore this facade of having it all together, but that she could break at any moment as she counted down the hours until her father's memorial the following day. Something that her mother, sister, and herself have not fully grasped even though it's been five years. I could also see that Jonah was having a tough time at accepting the new life his mother forced him into when she married someone new and uprooted them to the fancy new neighborhood, leaving all of Jonah's friends behind. I saw the picture Schmidt was painting, very vividly, but I just didn't quite connect with where it was headed. I don't know if I've ever experienced a novel where I felt so unsure of it, only to completely flip gears and steer me in the direction to where I didn't want to put it down. As the day followed through into night, Brighton and Jonah's paths collided once more, bringing them down a path that would shake things up before it got better. This is when I became really focused on the story and was determined to see it through to the end. Jonah's character took on a life of its own and he became someone that I could see, coming off the pages. His development as he opened up and allowed Brighton in really surprised me, but in a good way. I was drawn to their interactions and didn't want to see it end. That is truly my only complaint once I finished. I wanted more. As much as I love a story being told over the course of one night, I wasn't ready to say goodbye to Brighton and Jonah. There's just enough fluff to keep things sweet and comfortable, adding a deeper pull that will attract readers who appreciate depth mixed in with their contemporary YAs. If you're like me and on the fence due to a slow start, give it a chance, and I hope you'll be pleasantly surprised as I was. I read this this weekend, knowing what you thought of it, and I agree about the beginning, I wasn't bored by it, but I definitely thought the way that their backgrounds were being presented was a little strange and there was something lacking. As the story went on I fell in love with both of them though and I was so impressed with the book by the end. This is one of the next books on my to-read list -- looking forward to it! I like the way this sounds and I LOVE the cover. SO MUCH. I agree about books set over the course of one day. I'll keep my eyes out for this one and see if I can grab it when I see it. I love the way the ending made you love the story. Great thoughts, G.
I've been looking forward to reading Bright Before Sunrise ever since I saw Anna feature it during a Waiting on Wednesday post last year :) Like you, I really enjoy novels set during a condensed time period, whether it be a matter of hours or a couple of days. It's such a challenging concept and I love to see what an author can accomplish within the framework of that idea. I also really like stories where opposites attract, and am eager to see what Brighton and Jonah can teach each other given their vastly different experiences. I'm so happy to hear that despite a rather slow start, this was one book that eventually drew you in and left you wanting more. I think the latter is one of the highest compliments you can pay a book - That the characters are so realistic, so interesting, and so loveable that you never want to say goodbye. I CANNOT wait to read this one! I love books that take place over the course of the day because they show how much of a difference one day can make in a life. I'm glad there's some depth to this one because I'm really not a fluff kind of girl. Brighton and Jonah's stories sound so interesting and I can't wait to see how their worlds collide! I'm so curious about this book! I love that it takes place over that short period of time, because it lends an urgency to the story AND shows how important every minute of a single day can be. I'm glad that it seems like this story is fully developed, and I'm eager to meet these characters even more after reading your review!